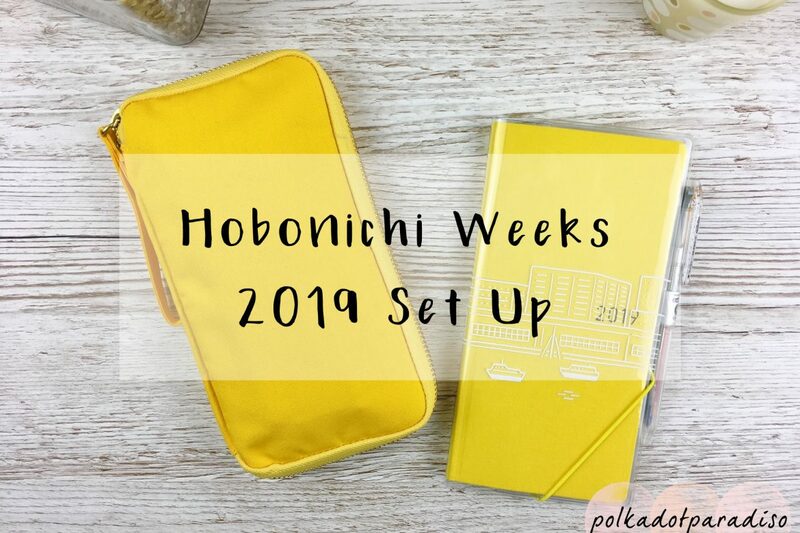 Next up in my planner set up for 2019 series is my Hobonichi Weeks! Earlier in the month I shared my Hobonichi Cousin set up. That is my desk planner and I do the bulk of my planning in there. My Hobonichi Weeks is my Every Day Carry (EDC) and lives in my handbag. It’s a banana yellow standard Weeks, with a Cover on Cover on it. I don’t know where my sudden love of yellow has come from, but it’s taking over! First up I added a Hobonichi Page Keeper to keep the Weeks closed. The Cover on Cover doesn’t have a traditional way of keeping itself closed (though there are hacks you can do). Your two main choices of what to use are the rivet band and page keeper. I went with the page keeper as I realised the rivet band would annoy me having to take on and off all the time. The elastic on the page keeper is very easy to use with the elastic just flicking on and off. Then, to finish off the outside I added some monthly tabs. I got frustrated with not being able to find the correct month last year, so I made sure I created nicely sized tabs for the both the Cousin and the Weeks. In the front cover I added some Hobonichi pockets for extra storage. These are lesser used cards that don’t need to be in my purse. The pocket on the left hand side has remained empty, but is the perfect place for some sticky notes. What I did add above though, are some Coco Fusen tabs. I absolutely love these. You get four different colours in a pack and each colour is individually packaged. That means you can peel and stick individual ones anywhere. I’ve seen some people stick them to the outside but I prefer the inside cover. These are high quality plastic tabs and the way they’re made, they’re like tissues. Every time you take one, another one is half pulled out of the packet ready to go. Last year I didn’t initally use the yearly overview pages as I wasn’t really sure how. This year, they’re being used for social media planning. As with the Cousin, I used my label maker to create the title sticker. The idea is I have my photographs list in my Cousin I have that open while planning what will be posted each day. At the top of each month there is some extra space that I’ve marked as ‘events’. Anything that I know is going on that month will get jotted in there with dates. That way I’ll know if there’s anything in particular I should be posting about on a certain day. Examples of this would be planned blog posts or sticker releases for the shop. In terms of monthly planning, this hasn’t changed too much from last year. The only thing different is exercise tracking. This is now in my health planner (set up post coming soon). When going through my sticker stash I rediscovered lots of cute little kawaii stickers and realised they would be perfect for my Weeks planning. My monthly pages now look so much more fun! My weekly pages also don’t look too different from 2018. The great thing about the Hobonichi Weeks is all the notes pages you get at the back. So far I’ve set these up as my budget planning pages for the year. I’m following my usual budget planning process in these pages. On the left hand side is my the incomings and outgoings for the month. At the bottom I add everything up at the end of the month and whatever is left goes straight into savings. On the right hand side is where I track my expenses and colour code them according to what category they fall into. They only thing I’m changing up this year is breaking down my categories a bit more. So under ‘other’ I’m going to be breaking it down into clothing, craft/planner supplies and beauty. I’ve left space for another 11 months work of budget planning and then marked the next page with a flag. The rest of these pages will generally be used for random list and notes. I plan the move the page flag to the next empty page so I can always quickly find it. Things are pretty simple in the back cover. I used the sticky pocket that comes with the Weeks in the inside left. This houses my forward planning sticky notes (which I had misplaced when setting up this planner). They’re from Midori and perfectly sized to fit in the boxes of the monthly view. When I’ve made any plans or even have tentative plans for a month I haven’t set up yet, the plan goes on the sticky note and that goes in the correct date box. In the right hand cover the page keeper lives in the cover pocket. I used to have my Pilot Coleto in the pen loop. However since purchasing a Hobonichi Drawer Pouch, all pens live in there instead. Towards the end of last year I was finding the Cadenta Notebooks cover too bulky. I was also using the White Lines version of the Weeks which just didn’t lay flat at all really. I much prefer this slimmer set up and the colour is beautiful! While there is some duplication of planning info between this and the Cousin I try to keep it relevant. Generally the monthly views are replicated in both as future events and plans are the things I’m more likely to need to know when I’m out and about. In terms of my weekly planning, I try and keep it to just things I’ll need to know when I’m out of the house, and events. However, I do really like planning in my Weeks and sometimes I will repeat the bulk of my planning in there, just because I enjoy it. If you’d like to see a more detailed post about how I plan my weeks in both my planners, let me know in the comments! This post contains affiliate links. They don’t cost anything to follow, but do help support the blog!